C was created by Dennis Ritchie at the Bell Laboratories in early 1970s. It was initially implemented on a system that used the UNIX operating system. C was the result of a development process which started with an older language BCPL, developed by Martin Richards. BCPL influenced a language B, written by Ken Thompson, which was the predecessor of C.
BCPL and B were typeless languages whereas C provides a variety of data types. The fundamental type are characters, integers and floating point numbers of several sizes. Though, it has been closely asociated with the UNIX system. C is not tied to any one operating system or machine. It has been used equally well to write major programs in many different domains. a) Middle Level Language : C is thought of as a middle level language because it combines elements of high-level language with the functionalism of assembly language. C allows manipulation of bits, bytes and addresses - the basic elements with which the computer functions. Also, C code is very portable, that is software written on one type of computer can be adapted to work on another type. Although C has five basic built-in data types, it is not strongly typed language as compared to high level languages, C permits almost all data type conversions. It allows direct manipulation of bits, bytes, words, and pointers. Thus, it is ideal for system level-programming. b) Structured Language : The term block structured language does not apply strickly to C. Technically, a block-structured language permits procedures and function to be declared inside other procedures or functions. C does not allow creation of functions, within functions, and therefore cannot formally be called a block-structured language. However, it is referred to as a structured language because it is similar in many ways to other structured languages like ALGOL, Pascal and the likes. language. It refers to the ability of a language to section off and hide all information and instructions necessary to perform a specific task from the rest of the program. Code can be compartmentalised in C using functions or code blocks. Functions are used to define and code separately, special tasks required in a program. This allows programs to be modular. Code block is a logically connected group of program statements that is treated like a unit. A code block is created by placing a sequence of statements between opening and closing curly braces. c) Machine Independent (Portability of Code) : The code written in c is machine independent which means, there is no change in ‘C’ instructions, when you change the Operating System or Hardware. There is hardly any change required to compile when you move the program from one environment to another. Eg. Program written in DOS Operating System can be easily compiled on UNIX operating system by copying the source code on to the UNIX operating system and compiling it over there. d) Fast Speed ( Better Performance ) : The execution speed of programs written in C is very fast since the statements are converted to few machine instructions which directly go into the processor for implementing the task. e) Keywords with Libraries : The Original ‘C’ ( developed by Dennis Ritche ) is having only 32 keywords to perform all tasks which sometimes makes programming very tedious. But now we have ready made libraries of functions which can be used to perform simple tasks very easily without much of the coding. Library functions like printf() and scanf() can be used for Input and Output, they belong to stdio (Standard Input Output ) library. Compiler Language : C Language uses COMPILER to translate your instruction code to machine code. 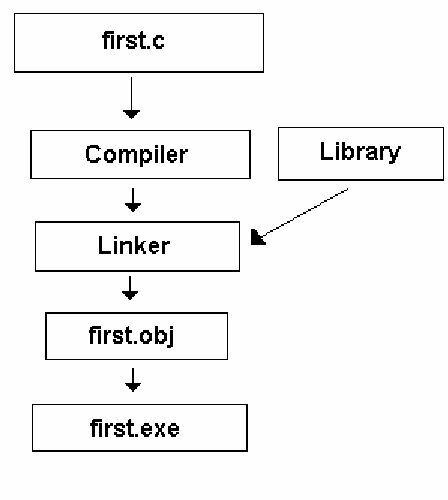 Compiler takes the text source code and coverts to object code and then Linker ( part of compiler only ) converts it to executable code by taking reference of Library. ; as statement terminator : In C ‘;’ is used as statement terminator. That means we can write as many statements as we want on a single line since statement is not terminated with new line character. Case sensitive : C is very sensitive as far as Case is concerned. var & VAR are two different entities in c. One should remember in what case the variable were declared. For convenience everything is declared in lower case only. /* */ for writing comments in program.